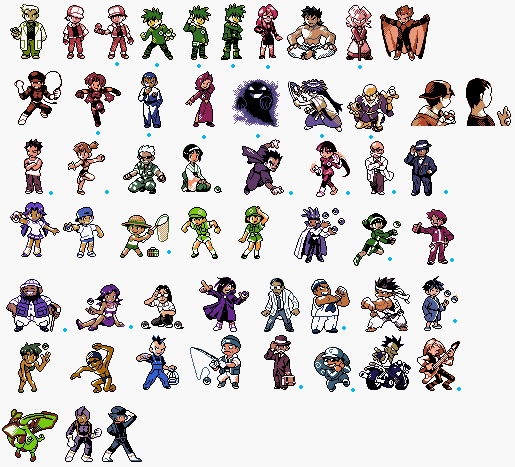 Hello all, I have some GSC styled trainer sprites/minor edits to post. Blue Dot=Edited some way or form. Red: Changed Hat and hair. Misty: Used the yellow sprite because RBGY is a blob, changed some shading to give the illusion of a 2 piece. Koga: Revamped the original sprite, flipped it and some minor ninja edits. Sabrina: Added some Psychic flair to her. Giovanni: Completely new sprite resembling his mobster look in later generations. Hiker: Fleshed out beard and cane a little, made other arm look like an arm and not a stubby hand. Rocker: Changed look so we can actually see what he is. Flygon Devamp, Other Rocket Admins. I am working on most of the RBGY classes because I really, Really, REALLY would love to see a RBG remake on the GSC engine. Now those are pretty damn cool. Also Mateo at one point was doing something like that for his Silver Rom Hack, Secrets and Rumours, but because of how tedious and difficult it was to remake Pokemon Red in Silver, he decided to move it as a Pokemon Red hack instead. But he hasn't worked on it since he is busy with Pokemon Christmas, which he is finalizing for 2014. Could these be used in Gen I, like with Danny's Gen II Graphics Hack for Red/Blue since it has full color in it? Hi guys, n00b question here; How can I fit 64x64, or even 40x47 to 40x40 without messing the sprites up? If you are trying to scale down a sprite to a certain size, like 64x64 to 40x40, you would start by eliminating all the white rows/columns on all four sides (maybe you did that and that's where you got (40x47). Then you could use two approaches. I either eliminate rows from somewhere in the middle of the sprite to "squish" the sprite, or you can scale the sprite in a program like Gimp. Although, you shouldn't have to go below 56x56 (or 48x48 for back sprites).